The replacement battery set supplied by Sigma Batteries for Emerson AP-130 AP23 3 kVA UPS UPS consists of EIGHT 12V 18Ah batteries, from Sigma Power Systems. The part no for each battery is SG12180FP. FP terminal is a thick post with nut and bolt to handle higher current required by heavy duty Wheelchairs . Using thinner posts can result in higher heat during charge and discharge cycles and can cause damage to the post seal and result in lower battery life. Also the posts are designed for with safety in mind. This post are surrounded by the thick plastic cover. This will provide additional safety during installation and operation. This helps to reduce the accidental shorting of the terminals by the tools or other parts in the wheelchair. Get best price and with highest quality. 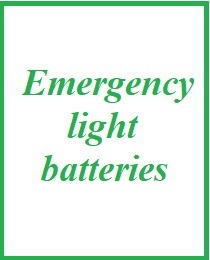 Each battery in this high capacity replacement battery set for Emerson AP-130 AP23 3 kVA UPS has the following features. This is a SLA (Sealed Lead Acid) battery with rechargeable capability. Positive plate of Emerson AP-130 AP23 3 kVA UPS scooter battery high capacity battery is made up of lead di-oxide while that of negative plate is made up of lead. Positive and negative plates of the battery are separated by a glass mat. The electrolyte for this SLA battery is sulfuric acid, with the specific gravity of 1.300. The electrolyte is absorbed in the separator, glass mat. Hence it is called “AGM” for this battery technology. Each battery in Emerson AP-130 AP23 3 kVA UPS consists of six 2V cells. These six cells are connected in series internally to give 12V. The case material is ABS plastic. The Cold Cranking Amp (CCA) rating for this battery is 283A. This battery has a nominal capacity of 18Ah at 20 hour rate. This means if you discharge the battery from a fully charged state at a current of 0.9 Amp (20 x 0.9 = 38) it will take 20 hours to reach the end of discharge voltage of 10.5 V.
The equivalent battery supplied by Sigma Batteries for Emerson AP-130 AP23 3 kVA UPS battery is SG12180FP from Sigma Power Systems.